Well, I thought we'd get this going sooner than we have, but life has been getting in the way. We (we being me and my daughter) sat down today and did some work on this here web site. We're learning how to set it up as we go. In the meantime, here's a pic to give you a sample of what we're working on outside this site. 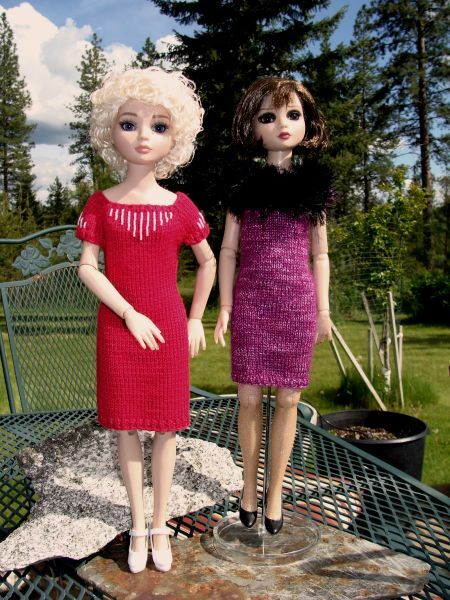 These gals are two of my Robert Tonner Ellowyne Wilde dolls. The one on the left is Essential Ellowyne Five (Blonde), the one on the right is Great Depression Ellowyne. I call them Ellie and Debbie. I designed and knit the dresses they're wearing. That's what we do. My daughter and I are knitters. We are planning to have a little dress shop here on this web site featuring One-Of-A-Kind knits we've made for these 16 inch fashion dolls. I got into collecting these dolls very recently. I mean very recently. Got the first one in April. I'd gone to My sister introduced me to these dolls Great Depression Lizette, who is the companion piece to Great Depression Ellowyne. There are only 200 of these Lizettes out there and I'm going to have one of them. Woo hoo! northern Michigan to take care of my dad because he had a stroke. Anyway, I've knit a few outfits and I'm enjoying it very much. It's a lot of fun designing clothing for these little ladies. So, stay tuned. We're starting to get our act together and soon there will be a selection of clothing available.